Do not ask why you serve. Only ask how! On Ysai Ydumi Jamadar, Fraal, and Xanthia have been inducted into a local crime syndicate because of their useful skills, and have spent the last six months assisting in various minor shady dealings while continuing to investigate the export of Xenos artifacts from the planet. 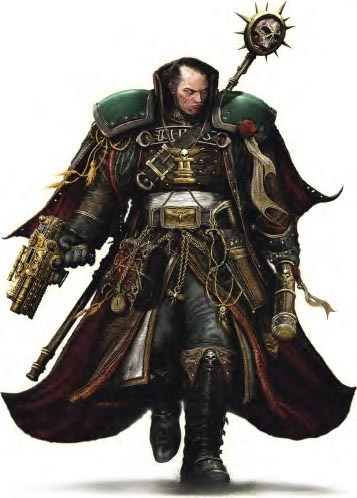 It appears that at least some of the exports are legitimate, as there is a contingent of Adeptus Mechanicus tech-priest aboard the station who are supposed to examine the artifacts and declare them pure before they are exported. However, there is a thriving smuggling business aimed at moving Xenos artifacts off planet without inspection, and some dangerous artifacts are being moved. Thus far, however, they have been unable to continue their investigations in the upper levels of the station, which they cannot gain access to. Lt. Hernandez is inducted into the Inquisition by Inquisitor Skane, and taken to Ysai Ydumi by Narthax, who tells him to make contact with the agents already there and to wrap up their investigation within a month. Narthax then points out Xanthia to Hernandez and departs, leaving him to initiate contact. After some mutual suspicion, the agents decide to use their new acquaintance to gain access to the upper levels of the station, which are a vacation spot for noble, and convince the syndicate they have been working for to smuggle them into the spaceport. Once there Lt. Hernandez becomes Sir Hernandez and secures a suite for himself and his "entourage", then the agents begin their investigation on the noble levels, with Hernandez circulating among the nobles and the rest circulating among the servants. It is soon discovered that the staffs of nobles visiting Ysai Ydumi live in a state of constant fear due to the number of "disappearances" that go on. The agents take this as an indication that nobles are offloading a portion of their entourage on Ysai Ydumi as a labour force on the planet below. Sir Hernandez, meanwhile is contacted by some nobles who are interested in discussing with him some "investment opportunities" that could bring him a great deal of wealth and power. He is taken to a clandestine meeting, but before divulging any details to him, his new associated demand that he desecrate an Imperial Aquila — one of the Eagle standards of the Imperial guard, a symbol of the Imperium, and of the Emperor Himself!